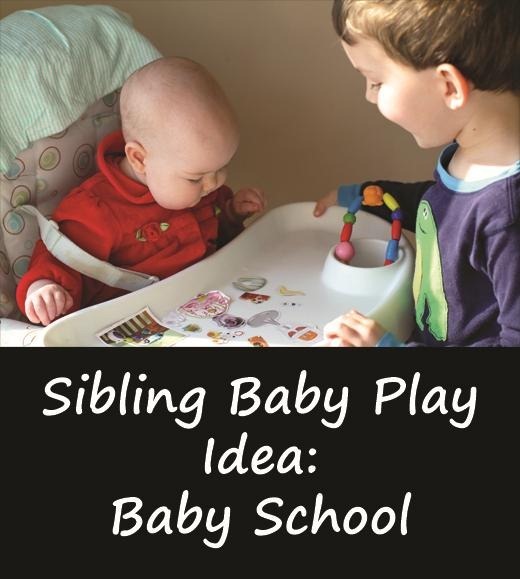 Baby school is a baby play idea that my kids invented – and I’m writing about it because I think it’s a great way for siblings to interact with a baby! The idea is very simple: the kids identify something they want to teach Anna about, and then they decide how to teach her. In this case, they cut out some pictures from a baby catalog to teach her about baby gear. Catalog pictures only work if you have a baby like Anna who is content to watch and not eat, but this can be done with just about anything – play food from a kitchen (check for choking hazards first), wood blocks, and even baby toys. My kids have talked to Anna about colors, shapes, numbers, and sizes. They are practicing their own knowledge more than anything, but since they see themselves as teachers they interact with their baby sister in a particularly empathetic way – giving her plenty of space, waiting for her to react to what they are doing, and treating her with a lot of respect. What are your favorite ways for siblings to interact with baby siblings? I’m saving this idea for the future. That is so incredibly sweet and your photo really captured a special moment. You have amazing kids. I am very grateful for my kids. I do think they are pretty amazing! I don’t know if there is anything that I love more..than to watch the older ones teach the younger ones! It’s truly beautiful! It is pretty amazing to watch! I remember loving that role as a child, too. What a wonderful idea! J loves coming up with ideas to try, and I’m always shocked when it comes to his level of comprehension. I love the ideas kids come up with – so innovative! That’s so sweet that your kids want to teach Anna so many things. So sweet! I <3 my sweet kids! I absolutely love this. Fun for the baby, builds connections and positive play with the siblings and is the best way for the older siblings to learn – by teaching! Another lovely post from you!! Pinned, of course. I really love watching it! Thank you, Deb – how fun that your son did this as well! Thanks for pinning, too! I love seeing how happy a baby’s excitement makes older siblings! I can’t believe Anna didn’t try to eat those! LOL! That is so cute that the kids like to teach her. This is so fun, and I love the picture! First of all, those baby cheeks are killing me. I actually said, “Ohhhh!” out loud. Secondly, this is great. I freaking love when my daughter decides to teach my son his letters and numbers. Sometimes she jumps into more complex ideas, and I just assume he’s absorbing it all for when he’s older. 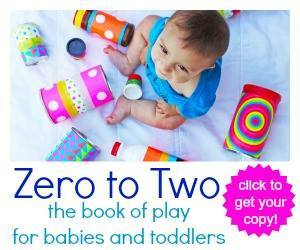 I totally love this idea, and my kids do it with the youngest who is 2. They love trying to teach her counting and numbers, it gives them a sense of great accomplishment and she feels so special getting attention from her older siblings! This is so very sweet! Your kids are so lovely with baby Anna! She is so lucky! What a great idea!!!! T loves reading to A and play with her. She introduces toys to her. A still doesn’t sit on her own but it works during tummy time! LOVE this post! Collin and Reagan play “preschool” and Kate is their student. They are always trying to teach her things. She is always interested in what they have to offer. I love watching kids teach younger siblings. So sweet! That is great and the highchair is the perfect little first desk! Highchairs to make excellent baby desks! I agree, it is definitely one of the biggest perks.